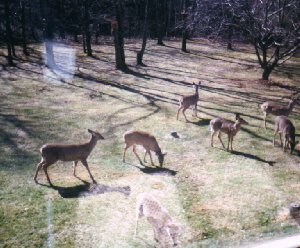 Seven of our deer feed on the first grass of spring in our front yard, 2/14/99. I have moved a lot of the text that was on this page to other pages with more detail. Mostly, I moved information on deer, foxes, ducks, and squirrels to pages on those animals. We have seen the following mammals on our land in central Maryland: deer, raccoon (keep me up at night screaming! ), opossum, gray squirrel, chipmunk, bats, red fox, cottontail rabbits, meadow voles, house mice, moles, brown wood rats (native rats that live in the country), and ground hogs (also called woodchucks; neighbors had them but I finally saw one on our land in October 2006 which you can read about in the November 2006 pond newsletter). I saw what looked exactly like a mink crossing the road about 1/4 of a mile from our land back in the 1990's I think. On 8/22/05, I could have sworn I saw three mink cross the back of our land. Read the details in my September 2005 newsletter. We have seen the following rare and/or large birds: turkey vultures, Eastern wild turkeys (only two sightings in the late 80's and early 90's but then another on 4/21/03, see my May 2003 pond newsletter under interesting animal sightings for details), red-tailed hawks (they bred on our land, and the babies scream a lot), red-shouldered hawks, goshawks, falcons, Canadian geese, and great blue herons (more often with my crystal clear pond with bright red fish to signal them in!!). Other animals we have include a few resident Eastern box turtles, tree frogs, American and common toads, bullfrogs, pickerel frogs, leopard frogs, wood frogs, spring peepers, and millions of species of insects and arachnids. Snakes that we have seen include black rat snakes, orange corn snakes, garter snakes, copperhead (one baby), one Northern ringneck snake (see my August 2006 Newsletter), and perhaps an Eastern diamondback rattlesnake (one baby). For more information on box turtles, go to my box turtle page. For more information on toads and frogs, go to my frog page. We know the following exist but we never see them: screech, great horned, and barn owls, and striped skunks (seen a few squashed on the road). Believe it or not, there have been unsubstantiated sightings of black bear, wolverine, coyote, mountain lion, and wolf in our area. The only one I saw was the wolf but it could have been a malamute (I can usually tell them apart) or part wolf. It was trying to kill my turkeys through the fence during a deep snow. Its behavior of stalking and strength slamming the fencing and its huge paw prints made me think wolf and not domestic dog. The turkeys were covered in blood afterwards from slamming the fence right back at him! I doubt any of the other sightings were real but you never know! For photos and information on our squirrels, see my squirrel page. For photos and information on our raccoons, see my raccoon page. Here is a mystery for you. 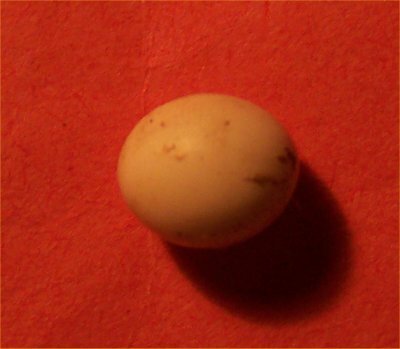 On 10/4/07, Dawn from New Hampshire sent photos of this egg that someone found. Someone told her it was a turtle egg but it is WAY too small for that. 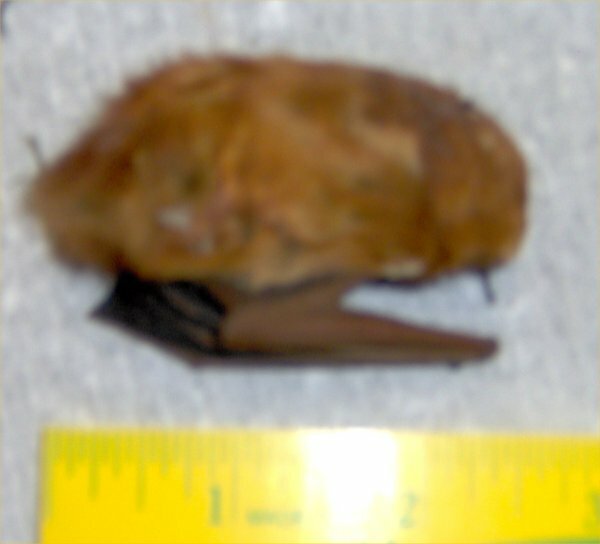 It looks to be about a quarter inch in diameter. It seems totally round (but she says it is not) which normally rules out birds. 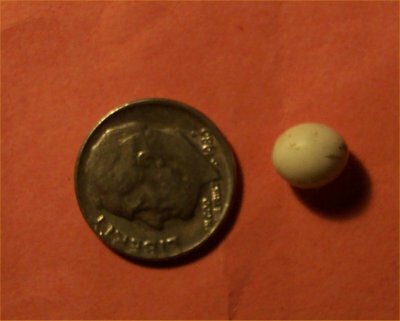 It is about the size of a hummingbird egg though so maybe it is a distorted one? The egg looks hard shelled but she says it is not hard nor is it rubbery? Do you know what it is? 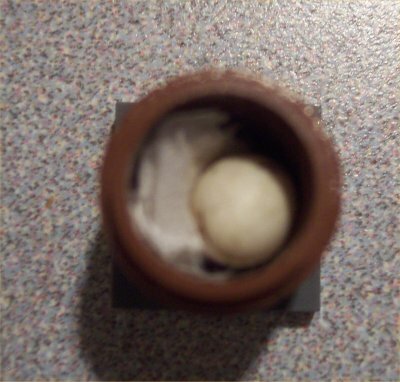 I am thinking it is a distorted hummingbird egg or maybe a fence lizard egg? If you know, contact me, and I will let her know. I have a lot of good books on wildlife and wildlife rehabilitation. E-mail me if you would like to know what they are (I may add them here later). I belong to the first four organizations, and my mother belongs to the squirrel club. These links were last tested on 2/12/07. The National Arbor Day Foundation - great inexpensive source for trees! The WindStar Wildlife Institute - includes a free e-mail newsletter. To see articles I have written for the newsletter, visit my pond articles page. Backyard Wildlife Habitat - a site with information on creating habitat for wild creatures and lots of neat stuff like your own online habitat planner specific to your area. 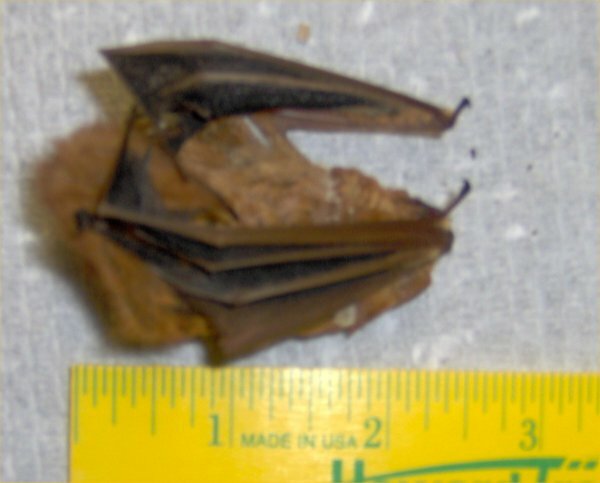 This is part of the National Wildlife Federation's enature.com site which is a great place to look up and identify species of animals native to your area by entering in your zip code. Wildlife Rehabilitators.com - this site contains a long list of wildlife rehabilitators around the world so if you need to find one to help a wild animal you have found, check this site if your local yellow pages do not help. See that this site knows about your local wildlife rehabilitator. Our local helper of wildlife was not on the list; it is called Frisky's. 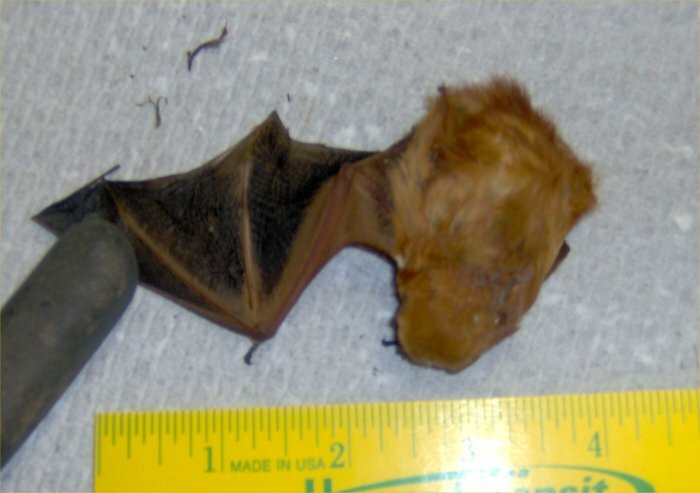 Wildlife Rehabilitators Look Up - this site also has a list of wildlife rehabilitators. Our property was designated a wildlife habitat by the following three organizations. Click on their web sites to find out how to register your wildlife oasis! The four keys to attracting wildlife are food, water, shelter, and a place to raise young. I also belong to a Backyard Wildlife Habitats web ring which can be found at the bottom of my pond page. National Wildlife Federation Backyard Wildlife Habitat - since 11/99; NWF BWH for short. One NWF Backyard Wildlife Habitat that has a web site is Wrenaissance which I found because they link to my pond page and other certified habitats. The WindStar Wildlife Institute also certifies properties but I have not taken the time to apply (no time!). "Any fool can destroy trees. They cannot run away; and if they could, they would still be destroyed - chased and hunted down as long as fun or a dollar could be got out of their bark hides, branching horns or magnificent bole backbones....It took more than three thousand years to make some of the trees in these Western woods....God has cared for these trees, saved them from drought, disease...a thousand straining, levelling tempests and floods; but he cannot save them from fools." "The variety of life in nature can be compared to a vast library of unread books, and the plundering of nature is comparable to the random discarding of whole volumes without having opened them, and learned from them. Our critical dependence on the great variety of nature for the progress we have already made has been amply documented. Indifference to the loss of species is, in effect, indifference to the future, and therefore a shameful carelessness about our children." 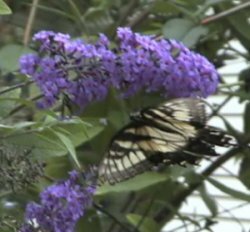 A tiger swallowtail butterfly feeding on one of our butterfly bushes on 9/21/02.